Here it is, my very first telly project for you. 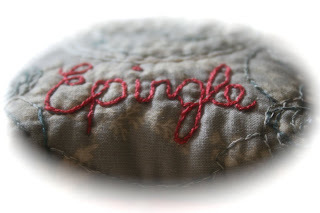 Coussin Epingle is French and it means "Pin Cushion". Please don't yawn, pin cushion yadda yadda but I wanted to actually use my Rouenneries Charm square pack instead of just gazing and gazing in awe at it. French General and Moda have created something so unbelievable yummy, so more-ish .. well, it's almost supernatural. So, I have fqs in the printed fabric coming, FQs in the wovens coming, a layer cake and I have 2 packs of the charm sqaures. I am beginning to believe I made need a jelly cake and I have a couple of prints that need to come home in yardage form. I have a problem. I have already pre-ordered the same in Rural Jardin. I do have a problem.... where was I? Yes, that's right the telly project. 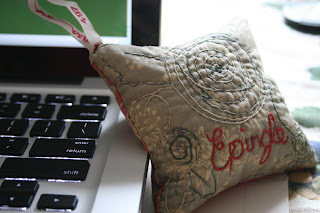 This is a simple little pin cushion to make but it will take you a couple of nights. 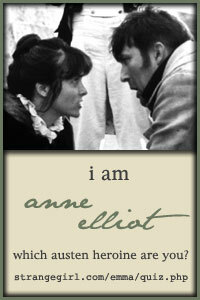 Still, its a great project to do in front of the telly. 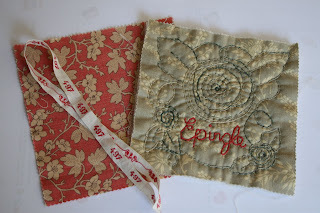 Here are the things you need to make the Coussin Epingle with. Two charms squares, one quilted by hand (yes, you read right) with the pattern and some vintage ribbon. I also filled my coussin with wheat. Makes it feel nice and has a great weight to it. I really believe that if we go to great lengths to use the best natural fibre fabric we can, it would be nice to fill it with something organic too. Although with kids toys it sometimes helps to have something able to be chucked in the washing machine and you just can't do that organically without giving your husband a massive stroke. This project is a freebie. Nix, nil, nada, zip is what you have to pay for this one. I am having technological issues with my scanner at the mo. It isn't working ... at all. So my wonderful friend is going to scan it for me and I'l pop it up here but if you would like me to send you the project (it's in PDF format), please comment and let me know you want one. I'll get it to you as soon as it's ready.